The Colts were way ahead of schedule in 2018. You wouldn’t have had to look far to find people in the preseason saying things like “if Andrew Luck can’t make it back on the field, this might be the worst roster in the league.” At the time, it wasn’t an insane thought, and it looked fairly accurate as the Colts started 1-5 and were beaten by the Jets in Week 6. And then things changed. The Colts improved in every facet and rode a much more friendly schedule over the second half to a 9-1 record the rest of the way, the AFC’s second Wild Card berth, and a first-round win over the Texans before running into the Kansas City buzzsaw in the second round of the playoffs. Still, there’s a reason the Colts were considered a dodgy team to start the season, and just because the team exceeded all expectations in 2018 doesn’t mean Chris Ballard can rest on his laurels and count on those performances to repeat. There is going to be ample talk this offseason linking the Colts to Le’Veon Bell, and there’s nothing wrong with kicking the tires on the free agent star. But Marlon Mack, Nyheim Hines, and Jordan Wilkins were a perfectly fine backfield committee in 2018, especially behind a suddenly impressive offensive line (the unit finished third in our end-of-season rankings). No, the Colts should be looking to pass-catchers this offseason, most notably a slot weapon to free up T.Y. Hilton for more outside work. 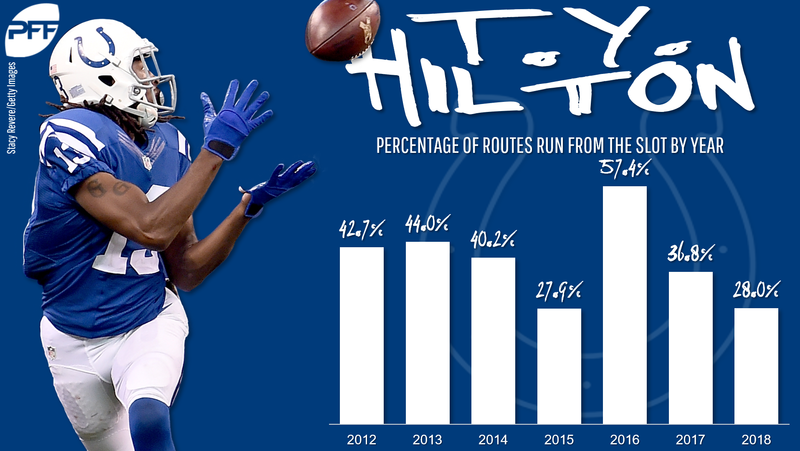 Hilton saw plenty of slot time early in his career, with 40% or more of his routes coming from the slot four of five years 2012-2016, but that number has dropped from 57.4% in 2016 to 36.8 in 2017 to 2018’s 28.0. Humphries, Tate, and Cole Beasley are the primary slot receivers available in this year’s free agent market, but Humphries is my preference for the Colts. He’ll only be 26 at the start of next season (four years younger than Beasley, five younger than Tate), and with the Colts positioned to be contenders for several years, the youth is appealing. Inman was bordering between journeyman status and “no longer an NFL player” status for the first chunk of 2018. But then he landed in Indianapolis, and from Week 8 until the end of the season (playoffs included), he had at least four targets in every game played but one and was the No. 33-graded receiver. Star? No, that’s not who Inman is. But he earned himself a spot as a complementary receiver on the 2019 Colts, and he could have flyer flex value if he’s back. As mentioned above the Colts’ O-line finished the season as our No. 3 unit. But Ryan Kelly struggled to stay healthy, and about 1,000 of those O-line snaps are hitting free agency. Quenton Nelson was amazing as a rookie, but the front office shouldn’t rest on its surprising laurels. The team has already re-upped Mark Glowinski after his breakout year. Keep building the unit.